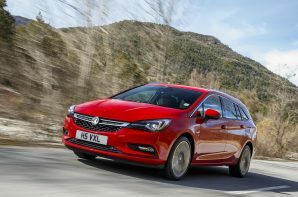 The current Astra hatch is a significant step forward in design and application, so there are no prizes for guessing that the estate, or Sports Tourer in Vauxhall speak, is also better. However just being better than your predecessor is no guarantee of success, so does the latest offering have what it takes? Mechanically things are pretty rosy. The 1.6 litre turbo diesel is right on the money for bhp and torque but also aces the official fuel economy tests. Obviously you can expect less in the real world and less still if you regularly load it up to the gunnels, but it is mightily impressive to get over 80 mpg even in lab conditions. Impressively Vauxhall has managed to slash around 190kg from the kerb weight and undercut the old model by nearly £1900. At the same time interior quality has been improved and the exterior given a more contemporary treatment. Neither are desperately exciting, but nor are they offensive. There are some areas where the big Vauxhall does fall a bit short. The ride is neither the most cosseting in the class nor the most exciting but rather falls into no man’s land. We would prefer it to do one or the other well. It is also middle of the class when it comes to actually being an estate. 540 litres of boot space with the seats up is OK but not stellar, but at least the load area is a good shape. The Astra Sports Tourer is keenly priced, well specified and much better looking than before. If you need ultimate load lugging capacity, an estate that will entice you to take the long way home, or something that will stand out from the crowd there are better alternatives, but if you are on a budget and need ultimate efficiency it makes a strong case for itself.